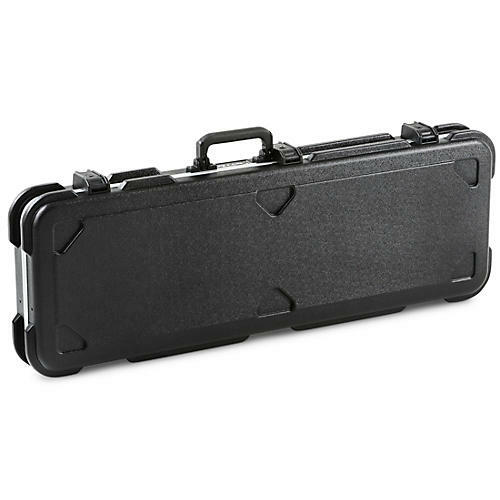 The SKB-66 Universal electric guitar case includes completely new latches made of virtually indestructable fiberglass reinforced nylon and include a TSA recognized and accepted lock. The over-molded handle is comfortable and perfectly balanced. This hardshell guitar case features molded in bumpers for protection, a "tongue & groove" valance to keep dust and moisture out. Also accommodates seven-string axes. All SKB hardshell cases are unconditionally guaranteed forever. That means if you break it, we will repair or replace it at no cost to you. For warranty service call 800-410-2024.